You could have zilch interest in art and you would still know this painting – The Kiss by Gustav Klimt. Very few artworks are as iconic as this one – if there were my life would be a lot easier. It’s risky making jokes about art as there is a danger of losing the audience if they’re not familiar with the artwork. Is there are a more dangerous abyss edge to be teetering on? I don’t think so. Try finding the episode where Bear Grylls draws art cartoons. You can’t – it doesn’t exist. Even he is too gutless. I don’t really have a surefire method for thinking up jokes but when I’m stuck one tactic is to write down as many aspects of the painting as I can, then focus on one of them. The blending together of the two figures, their different patterns merging imperceptibly, was the angle I stumped for. 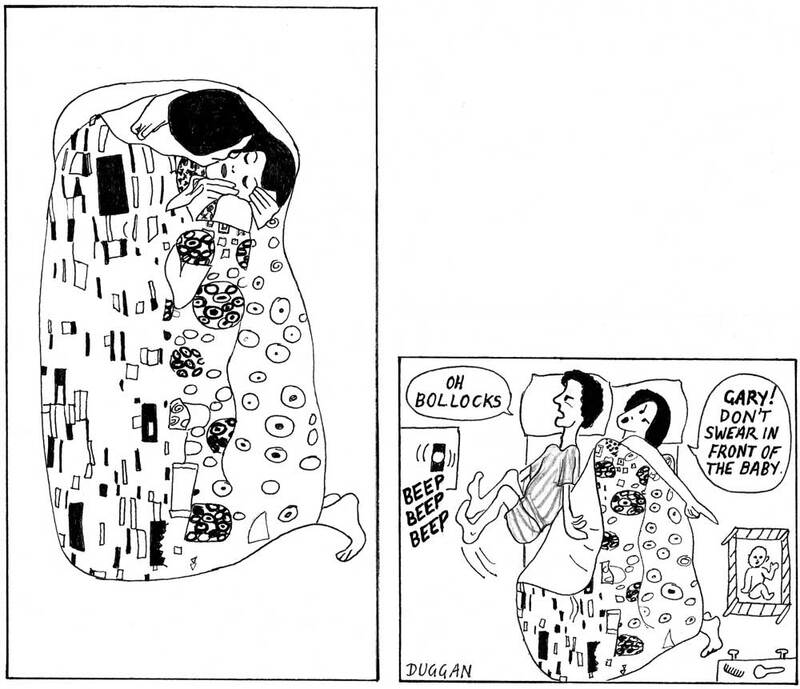 Once I hit upon the idea that the pattern of the Man and the Woman’s clothes was actually the pattern on a duvet (or blanket or doona), things quickly led to the above scenario. The humour is in the collision of idealised romantic love with the mundane bickering reality of a married couple. I had to use my imagination for this as my experience of marriage is of a blissful union of souls without the slightest hint of friction or disagreement. 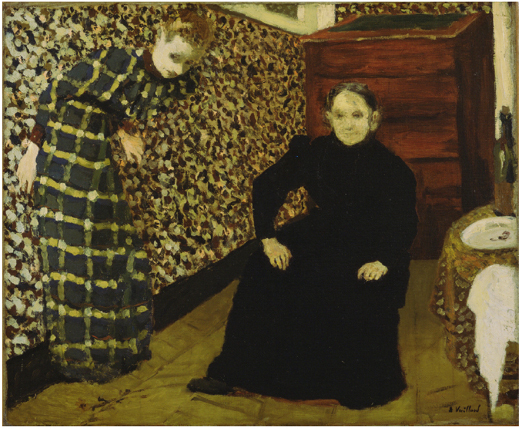 As an aside, another artist who does this blending of different patterns really well is Edouard Vuillard. 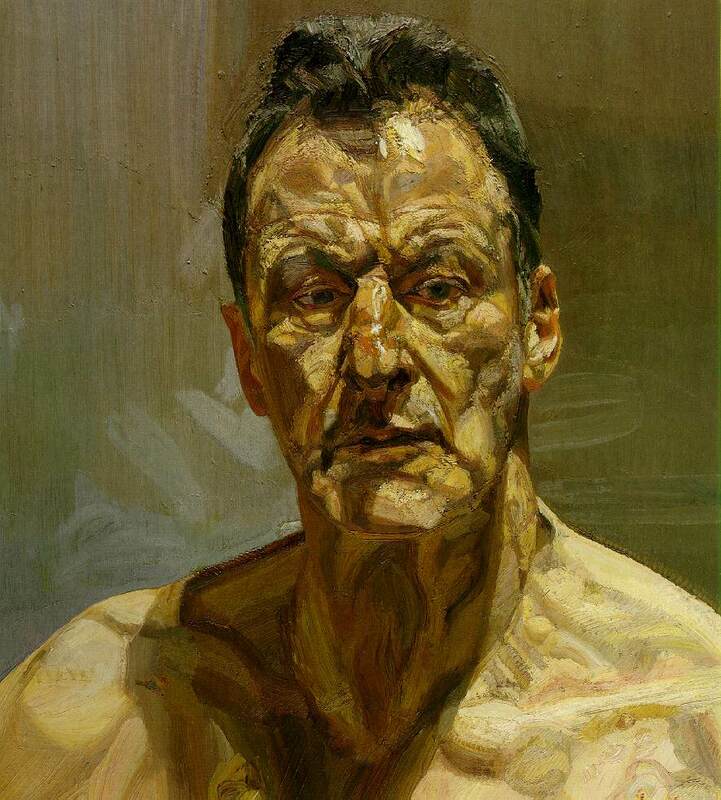 I sometimes play a mental game with myself of picking a year at random and deciding the best painting produced that year. 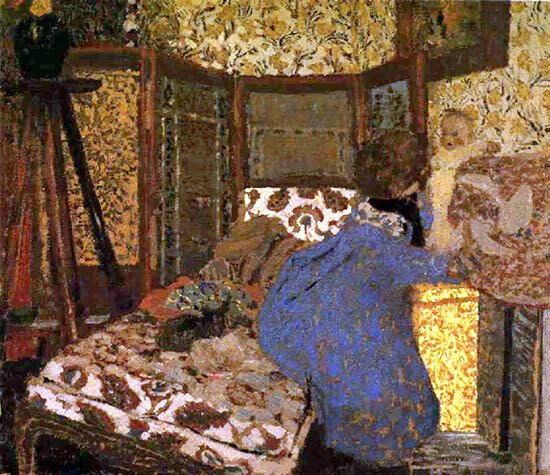 Vuillard, with his lovely little domestic interiors, has the whole of the 1890s covered (this is harsh on Paul Gauguin, who also hit his brilliant best form in that decade). But when it comes to thinking up new patterns, Gustav Klimt is in a league of his own. He loves it. He has often been accused of horror vacui, the fear of blank space. Who cares? The artist Hundertwasser said something about being able to make a whole career from the pattern found in any inch of a Klimt. This inexhaustible pattern-making ability was combined, in Klimt, with jaw-dropping technical skills (just check his early work) and a terrific sense of composition, making it impossible, on a purely visual level, not to be bowled over by him. At the moment my cartoons come out once a fortnight in the Guardian. However I try to write one blogpost per week. This is a dilemma that I have lately solved by writing on the subject of nothing every second week. Now though I will now dredge up an older cartoon for the in-between weeks and write about that. This is to keep you amused. It was worse than useless, although I guess I’ve had a stab at the last one. 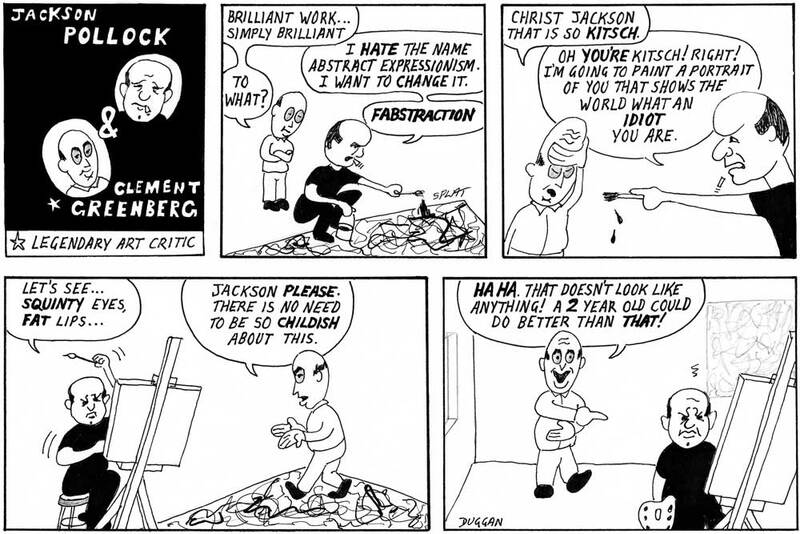 By the way, there is absolutely nothing wrong with an unserious name for an art movement. Look how successful PLOP art was!